The Communications committee of St. Martin’s is a group of members with an interest in communicating information about our parish and programs to our faith community in a timely manner. The members have a variety of skills and passions, and each is able to work in the area of his/her expertise. It is our goal to support and promote all programs and ministries of St. Martin’s By-the-Lake, producing whatever materials are needed and publicizing programs and events, both within the church and in the faith community. Because we believe that the Gospel transforms, renews and changes lives, St. Martin’s By-the-Lake is a vibrant Christian community welcoming all to Worship our God, Grow our Faith and Love our World. To be fully engaged in all that St. Martin’s has to offer, members and others must first be made aware of all that is happening within the church. We are available at all times to help with your program needs. The monthly newsletter which goes to all households contains a letter from the rector, as well as pertinent information bout upcoming events and other important news. —Deadline is the 10th of the month for the following month. A note from Rev. Dave giving us the latest news, what we need to know for the weekend, and ongoing announcements. Deadline is Wednesday noon. To have information listed in Sunday’s Bulletin, send info by Tuesday to stmartins@mchsi.com. Our website is a work in progress and promises to get better and better. To add your information to the website, send it to camillafarley27@gmail.com. If you would like to be part of the Communications Team, email us at camillafarley27@gmail.com. Our parish choir, comprised of four paid section leaders and volunteers, lead SATB hymnody, Anglican settings of the psalms, and offer anthems and motets weekly. Their repertoire is drawn from past and present standards of the Anglo-American sacred music tradition, with anthems by the likes of Charles V. Stanford, Leo Sowerby, David Hurd, Bruce Neswick, Richard Proulx, and motets by Thomas Tallis, Orlando Gibbons and many others. In addition to Sunday mornings and a full choral service of Morning Prayer on first Sunday of every month, the choir offers services of Choral Eucharist on St. Martin’s Day, Christmas Eve, and the Great Vigil of Easter. Worship is actively embellished by additional instruments and ensembles such as our Youth Praise Band and guitar folk ensembles which include Martin’s Minstrels and St. Martin’s Stringers. All are welcome to see where their gifts may best fit within our Worship ministries. Lay Readers are licensed by the Bishop of the Episcopal Church of Minnesota to lead public worship under the direction of the rector. A lay reader reads the Lessons, the Psalm, and the assigned Prayers. Lay readers are also asked to assist the clergy in administering the Eucharist. Ushers greet and assist current and visiting members of the congregation by handing out service bulletins, answering questions, offering help to those in need, and assist clergy during the offering and administering the Eucharist. The Altar Guild is responsible for preparing the altar for Sunday morning, as well as funerals, memorial services, weddings and other special services. Members also care for the sacred furnishings of the church that support the liturgical life of the parish. 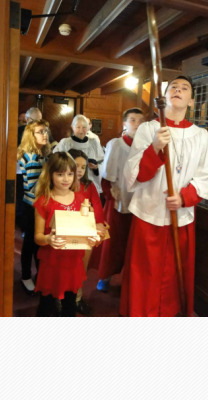 Acolytes assist the clergy in the celebration of the Eucharist and are provided with the opportunity to form a closer understanding of the Episcopal Church. The acolyte program accepts interested participants in 5th grade and beyond, encouraging older teens to become Lead Acolytes. Lead Acolytes, Acolyte Parents, and the Minister of Youth and Families support the growth of the group. Members of our Decoration team coordinate preparing the sanctuary and other areas of the church for festival days including Christmas and Easter. Our Fine Arts team brings artists their art to the congregation and our local community.